We get our first box office upset of 2019 as Aquaman is bumped out of the top spot by The Upside, as it's a sleepy January weekend before we get a blockbuster hopeful next frame. The Upside is the number one movie for the weekend, earning an estimated $19.6 million, beating expectations by several million. This is the first #1 movie for STX Entertainment, a company that has mostly put out mid-tier films and actually had a pretty lousy 2018, with notable disappointments Mile 22 and The Happytime Murders. Their highest grossing film is 2016's Bad Moms with $113.2 million (which opened at #3) so that record isn't in jeopardy, but they have to be very happy with this performance. They picked up the film from the wreckage of The Weinstein Company, and it stands to make back its reported $38 million budget after this opening. 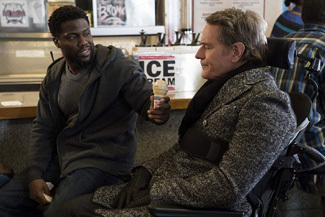 Anyway, The Upside is a remake of a French film from 2011 and stars Kevin Hart, Bryan Cranston and Nicole Kidman. Why did it open above expectations (which were around $8-11 million), especially since it wasn't a hit with critics (40% Fresh at Rotten Tomatoes)? Well, there's the star power of Kevin Hart, whose last effort, Night School, performed well enough, and his presence in this dramedy likely boosted it more than you think. In addition, while critics were lukewarm, audiences ate it up, giving it an A CinemaScore, so there's going to be some positive word-of-mouth, likely from older audiences. Aquaman slips to second after three weekends at the top (we haven't had a four-peat since Black Panther, which spent five weekends at #1) with $17.2 million, down 44% from last weekend. (Nicole Kidman stays at the top, though!) $287.8 million in four weekends is still solid, and it will pass the $300 million mark next weekend, the sixth film of 2018 to reach that mark. It's crossed $1 billion worldwide with this weekend's international grosses, the first film in the DC Extended Universe to do that (and who saw that coming?) We now look and see if there's enough left in the tank to match the domestic totals of Suicide Squad ($325.1 million) and Batman v Superman: Dawn of Justice ($330.3 million). New release A Dog's Way Home lands in third, with $11.3 million. Expected to be the top performer among the new releases, A Dog's Way Home found itself surprised by The Upside. January is apparently the time to release a movie about a dog, as two years ago A Dog's Purpose opened in January to $18.2 million and landed with $64.3 million. The move was shrugged at by critics (59% Fresh) but audiences thought it was fine (A- Cinemascore). The performance here isn't bad, it's just that The Upside overperformed. It was cheap to make ($18 million), so Sony should find themselves in the black with it. Spider-Man: Into the Spider-Verse continues to swing along with another $9 million and $147.7 million after five weekends. It's absolutely great that this one is continuing to hang on to audiences after the holidays, and could get all the way to $180 million by the time it's done. Please fast track the sequel, thank you.